Brent's Travels: Day 30 - Coast To Coast! I made it to California today, one day earlier than planned so I could get to the Chevrolet dealer to schedule an oil change & tire rotation as well as seeing if they can figure what went wrong to die on I8 in AZ yesterday in the middle of the desert. 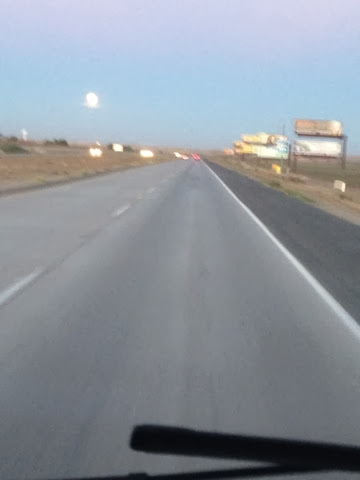 Overnight last night I didn't get sent away parking at the Flying J truck stop last night in Yuma, AZ. I chose this spot as I didn't want to break down at night on the highway. I have learned over the years that circuit is more dangerous when it is dark on the highway. Did you see the wonderful full moon last night. It was setting on my way across Southern California this morning. For those wondering what it is like to be a vagabond, as my called me yesterday. I offer the following. I have gotten used to not worrying where I will stay having the camper. I did initially concern myself with possibly being rejected somewhere but I have been successful with staying at a casino, Walmart, and truck stop. I still need to try a rest area. The camper is comfortable with heat, water, cooking, and toilet, if I choose to use it. Places I have stayed for free I have used their bathrooms as they were open 24 hours. 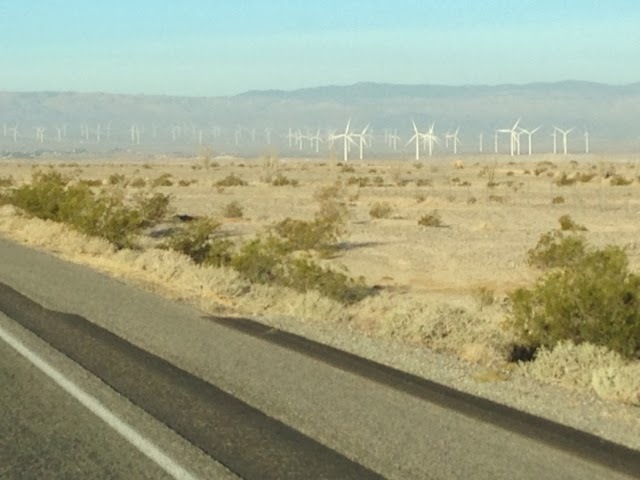 Here are the windmills before you climb the mountains from El Centro to San Diego. 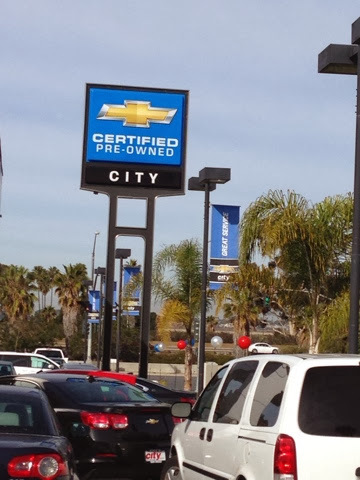 Arriving in San Diego, drove directly to the Chevrolet Dealer near where Clayton & family lives. I booked an oil change and tire rotation after 5300 miles over the last 30 days. I also asked the service dept to look at what may have caused the camper to stall yesterday. I have done some of my own research. It is possible that the fuel system is the culprit. The fuel pump/fuel filter restriction or pump is going. 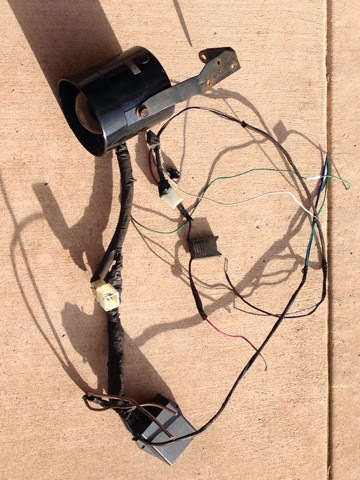 A poor connection or any of the wires from the engine to the fuel tank in the back. Lastly, in the fuel system it could be the fuel pump relay. My checked the connection but could not tell if they have a problem. Other possibilities that could cause the problem include the vehicle computer, oil sensor, or something in the spark delivery. We my never find the problem until it becomes more persistent. Oh well in checking the wires I know what and where to move to see if it helps. 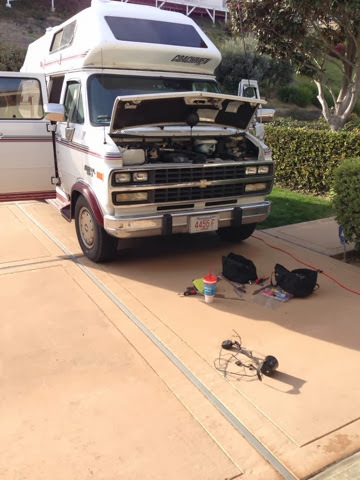 With the camper scheduled for service I let myself in my Son's house in La Jolla as the girls left today for a trip to the snow in MA. On the phone today I told Madison who is nearly 5, when she asked where I was now that she is in MA, and I told her we did a house swap and that I will see them on Tuesday. The camper needs some attention that I planned on working on once I got here. Today I was addressing some issues with the 12 volt electrical system. The biggest problem is that there is no documentation/schematic of what is where. I started this and I removed and old car alarm system that was original but aftermarket and has not been working in years. This took some time as they cut into wires and they needed to be corrected. The alarm was right above the battery and through the firewall in front of the driver. Here is the trash I removed. In doing this project I found there was an original charging system from the front battery to the back battery. It's design is not modern but effective but it has been disassembled by a prior owner. The system used a relay to connect the front and rear bstteries only when the ignition was on. This is not the best today as current technology utilize a voltage sensor to only connect the rear battery when the main battery has a high enough voltage rather than just connect the two batteries. This older system also had a larger solenoid that was user switched and this was disconnected and from what I can tell the part wasn't working. I will tackle this another day. My bicycle needs attention so a trip to the store tomorrow to but some new brake pads as the ones I have are hardened from being old. I need good brakes here with such steep hills. I wanted to go out for some exercise today but didn't as 1/2 the day was getting here and booking camper appointment and second half was working on removing the alarm. Tomorrow I need to get exercise. Granddaughter Madison who is in MA for the snow has her first ski lesson at Wachusett Mt. Yea. She gets fresh powder with the current storm. Taylor will be doing some sliding. I'll will be doing something warm.